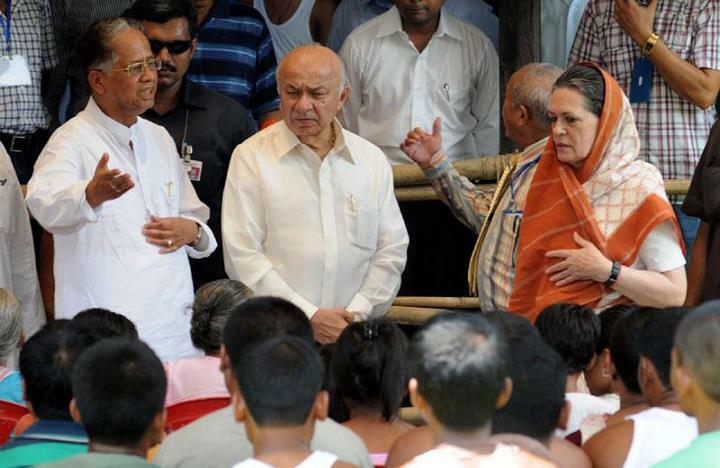 Union Home Minister Sushil Kumar Shinde and National Advisory Council Chairperson Sonia Gandhi along with Assam Chief Minister Tarun Gogoi talking to the riot victims, at Deborgaon Relief camp, in Kokrajhar district of Assam on August 13, 2012. Early August, Indian Home Minister Sushil Kumar Shinde termed the violence in Assam as unfortunate, which, as per the Government of Assam, occurred due to continuing simmering tension between Bodo and non-Bodo communities of Bodoland Territorial Area District on various socio-political issues. The latest violence has taken its toll – over 70 lives have been lost, several others are either injured or are missing, 200 villages have been affected and about half-a-million people reported running in dire confusion. Many people have been arrested and security agencies are now looking forward to some key leads in the spate, following which there have been high-profile visits to the affected areas by the political leadership. “That what has been happening in the last few days in some parts of our country, the growing sense of insecurity among people from the North-East living in different parts of our country; that this is something, which is more reprehensible; that all of us should work together to get this sort of situation brought under control without any further loss of time. I commit from the Government to work with all like-minded people to create a feeling of security among the people of the North-East residing in various parts of our country that they have as much right as anyone else to live, to earn and to study at wherever place they may go. India’s north-east is a very sensitive region and as such nothing should be used as an occasion to fan rumours to create an environment in other parts of our country, that the people from the north-east feel insecure. Must we realize that what is at stake is the unity and integrity of our country. To check spread of rumours, the Indian government has meanwhile banned bulk SMSes and MMSes for 15 days across the country. Five SMS per day limit has already come into effect. At the same time, it is a fact that the Bodo violence has brought to the fore the issue of illegal migrants in Assam. While some organizations have been maintaining that Muslims have been victimized in the name of illegal immigrants, others blame the administration for having failed to check the influx of Bangladeshi immigrants to Assam. It is unfortunate that the Assam violence has also had a spill over effect in other parts of the country especially on 11 August when a rally organised by Muslim organisations in Mumbai went berserk, leaving two dead and several injured.